In the last few years the research community has proposed several techniques for network traffic classification. While the performance of these methods is promising especially for specific classes of traffic and particular network conditions, the lack of accurate comparisons among them makes it difficult to choose between them and find the most suitable technique for given needs. Motivated also by the increase of P2P-TV traffic, this work compares Abacus, a novel behavioral classification algorithm specific for P2P-TV traffic, and Kiss, an extremely accurate statistical payload-based classifier. We first evaluate their performance on a common set of traces and later we analyze their requirements in terms of both memory occupation and CPU consumption. 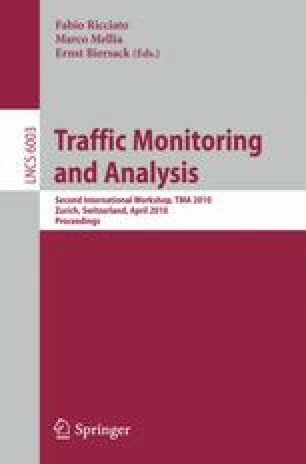 Our results show that the behavioral classifier can be as accurate as the payload-based with also a substantial gain in terms of computational cost, although it can deal only with a very specific type of traffic.